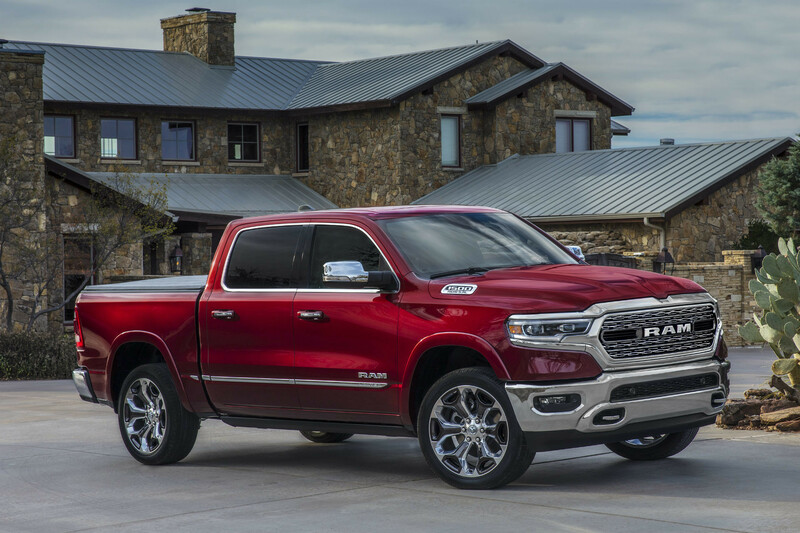 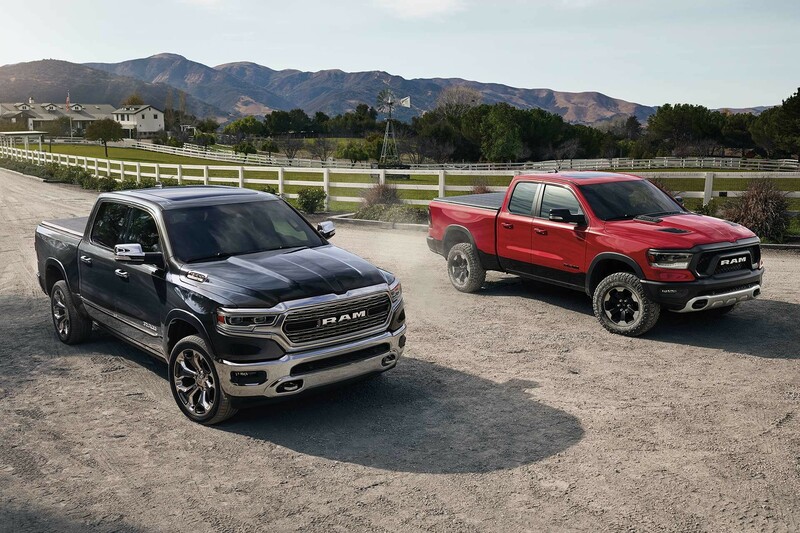 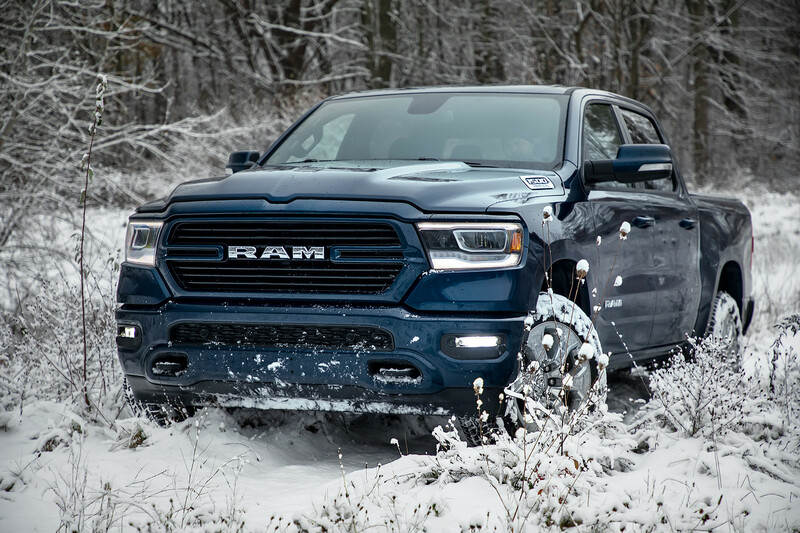 The All‑New 2019 Ram 1500 is available in multiple models and offers 14 new wheel designs in sizes ranging from 18 inches to an impressive 22 inches in diameter. 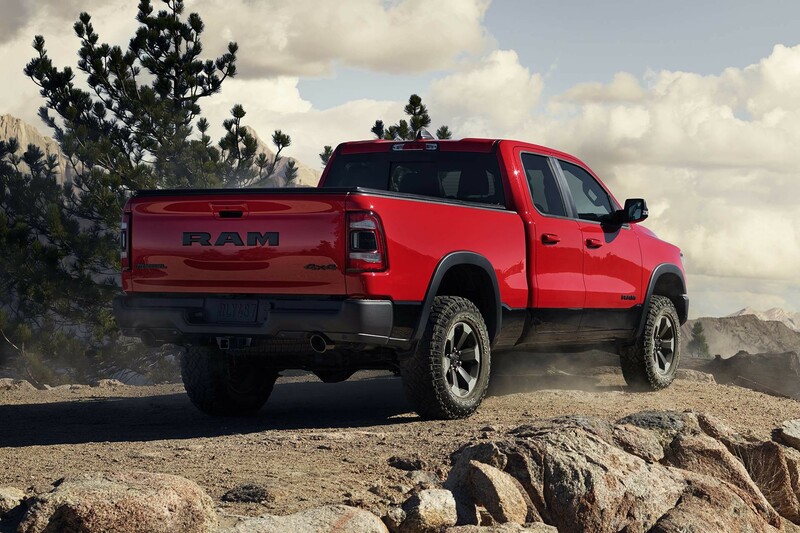 A new Elocker® Electronic Rear Locking Differential gives the All-New 2019 Ram 1500 impressive off‑road performance. 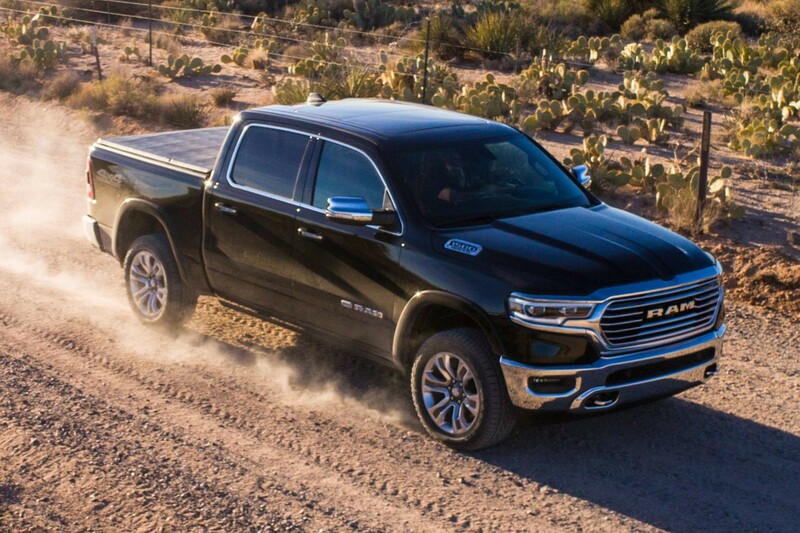 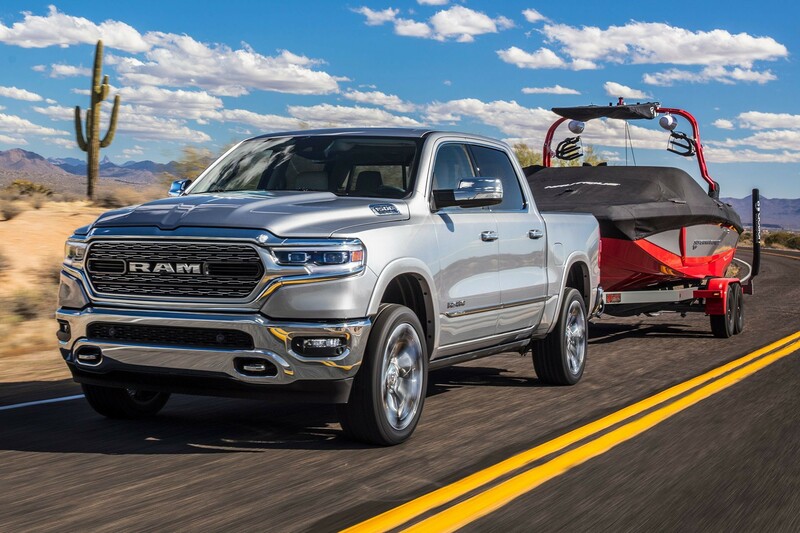 With a Best‑in‑Class V8 engine towing capacity Based on Automotive News Full-size Pickup segmentation of up to 5,783 kg (12,750 lb), the All‑New 2019 Ram 1500 is ready to take on even the biggest jobs. 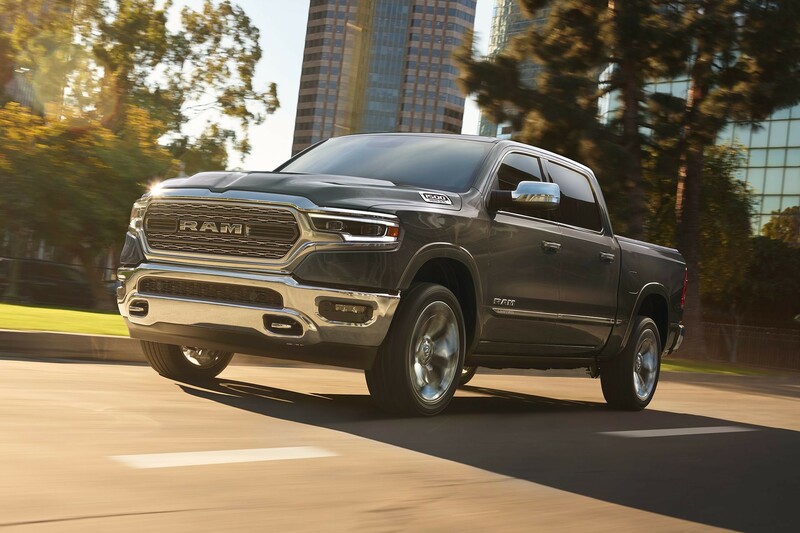 Active aerodynamic features and sculpted styling have helped improve efficiency on the All‑New 2019 Ram 1500, resulting in superior performance. 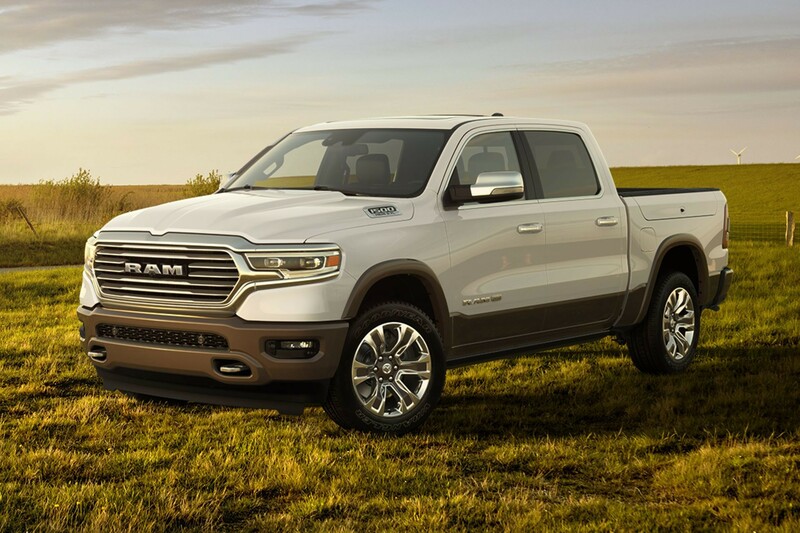 The All‑New 2019 Ram 1500 has been engineered with an array of innovative features, like an available dampened tailgate with power release and a newly sculpted roof. 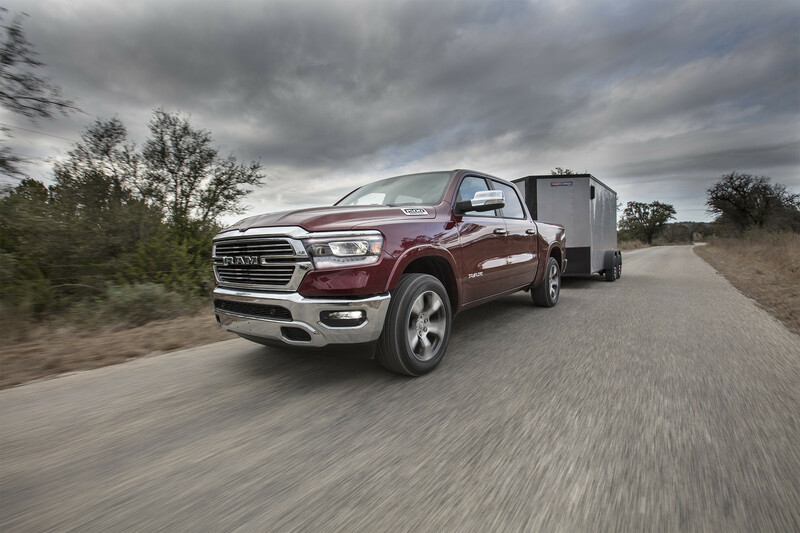 Automatically deploys at higher speeds to reduce aerodynamic drag and reduce fuel consumption. 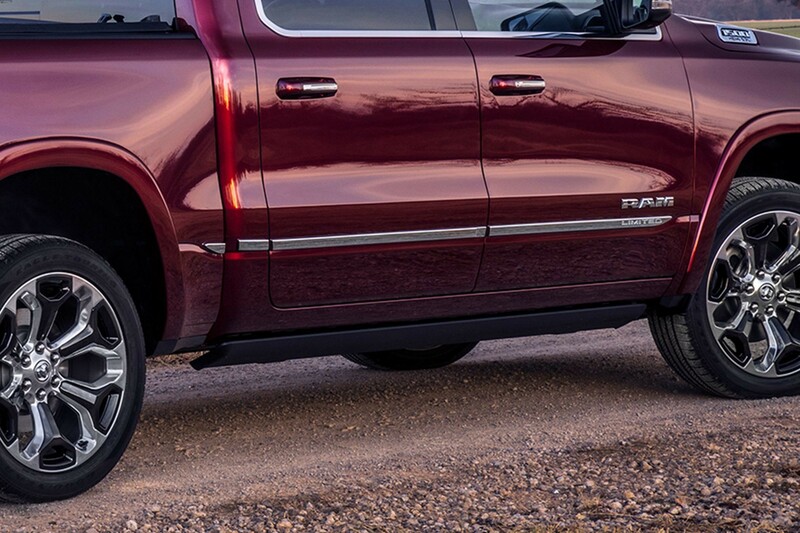 Step right up with retractable power side running boards. 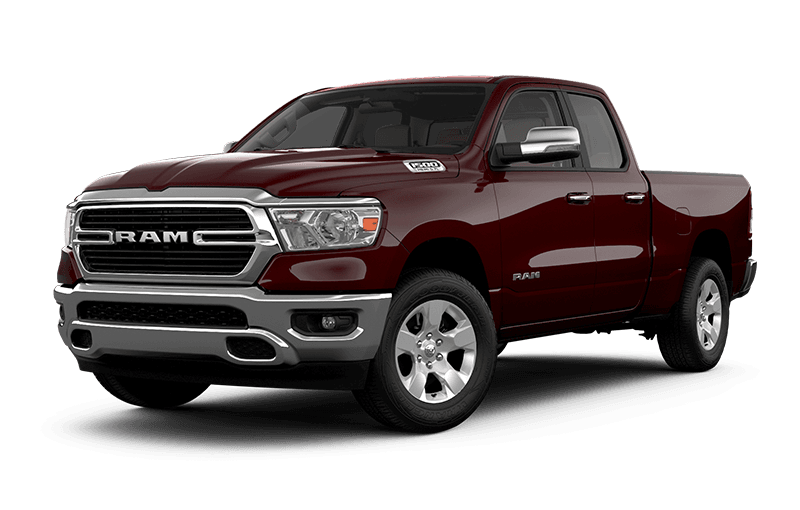 The All‑New Ram 1500 includes a chiselled Ram’s head badge and “R‑A‑M” grilles. 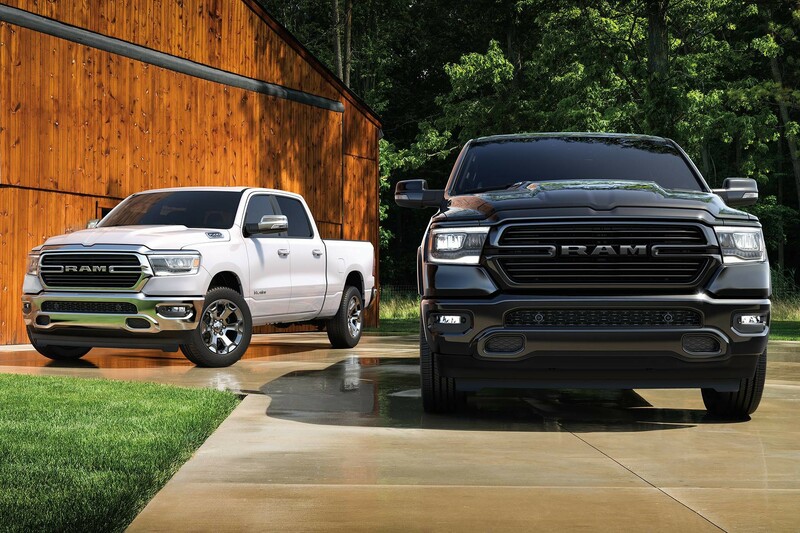 Enhanced exterior styling with new grille options to choose from. 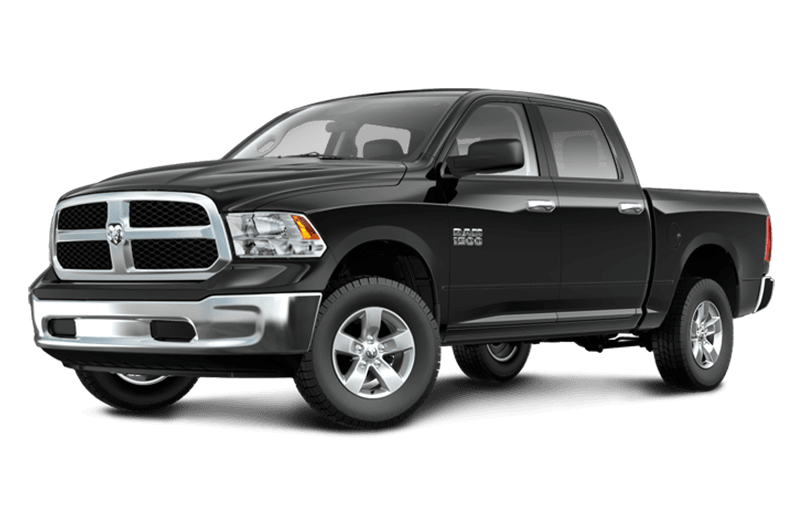 Offers a longer wheelbase and overall length which translates into more interior space. 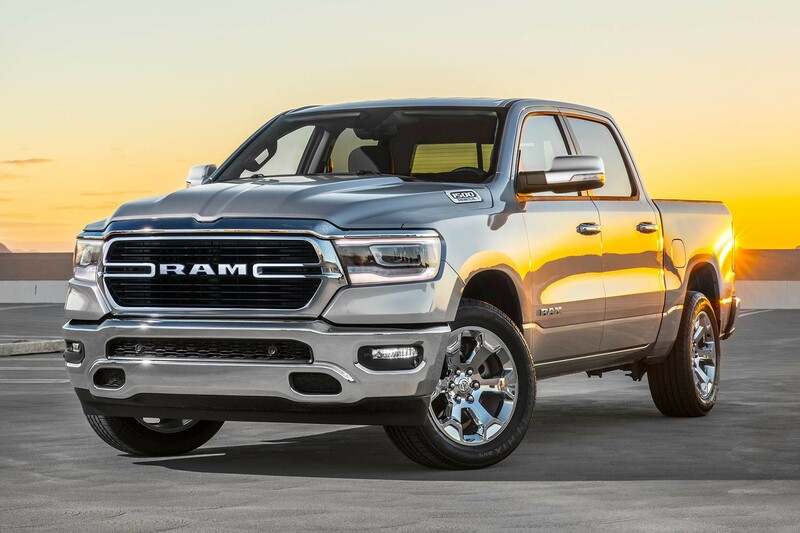 Steel bumpers stand out below one of the most elaborate grilles in the auto industry. 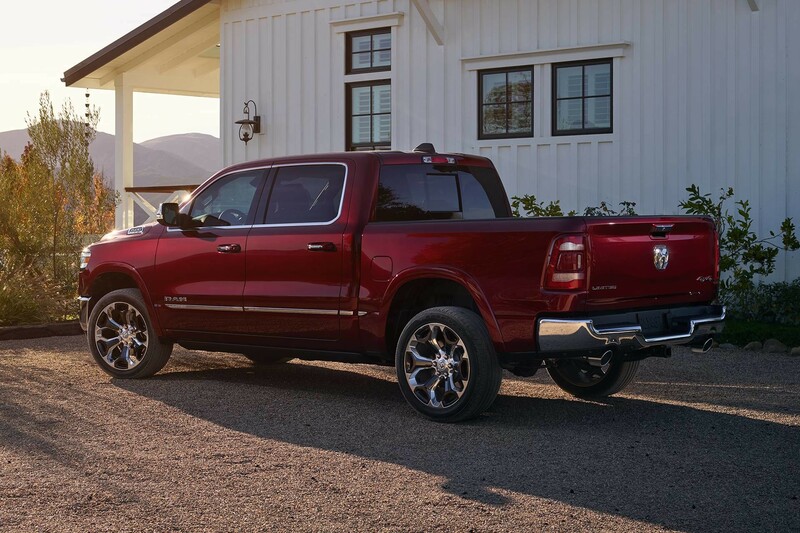 Boost the look of your Ram 1500 Sport truck with available 22-inch wheels. 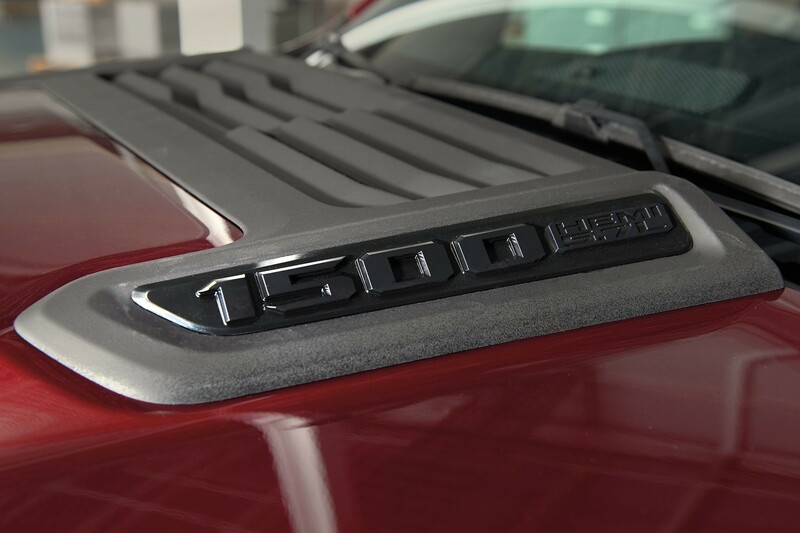 Opt for the available Sport performance hood with hood vents, for a bold appearance on this Ram 1500 Sport. 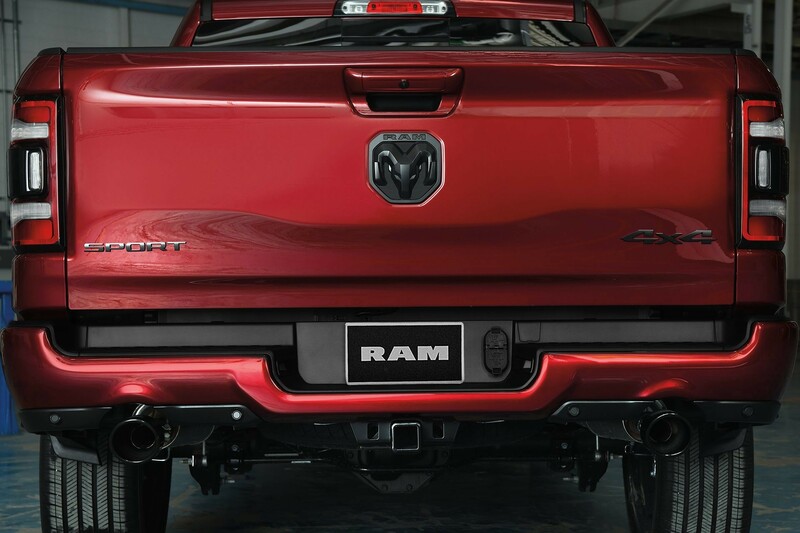 The Sport boasts a unique monochromatic exterior with all‑black badging, including unique "Sport" badging, and body‑colour front and rear bumpers from which dual black‑tipped exhausts peek out. 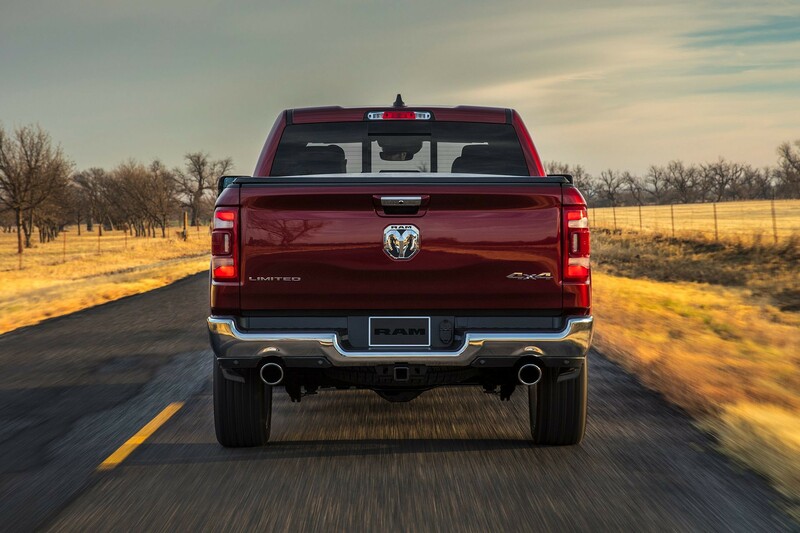 The Ram 1500 Sport model’s assertive look is powered by a standard 5.7L HEMI® V8 that delivers a muscular 395 horsepower and 410 lb-ft of torque. 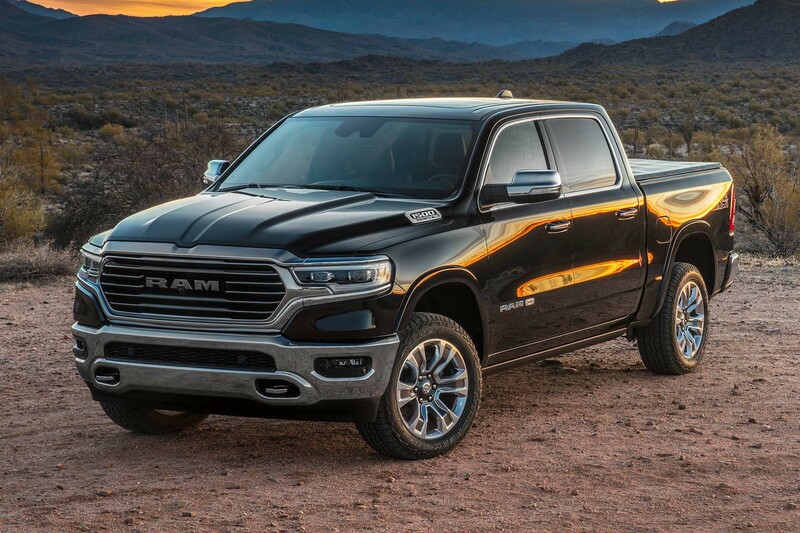 Never out of place, and just like you, the All‑new Ram 1500 look fantastic wherever your travels may take you. 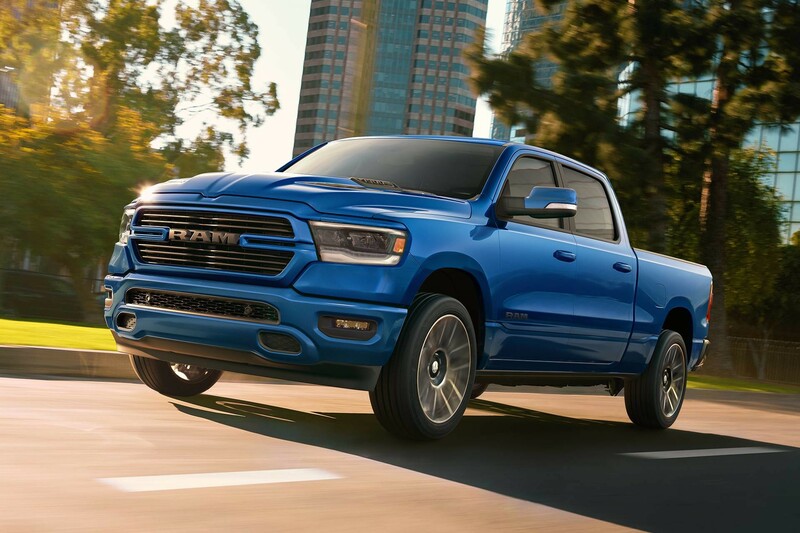 From the ground up, the All‑new Ram 1500 has been redesigned from the new grille to the available 22‑inch wheels and so much more. 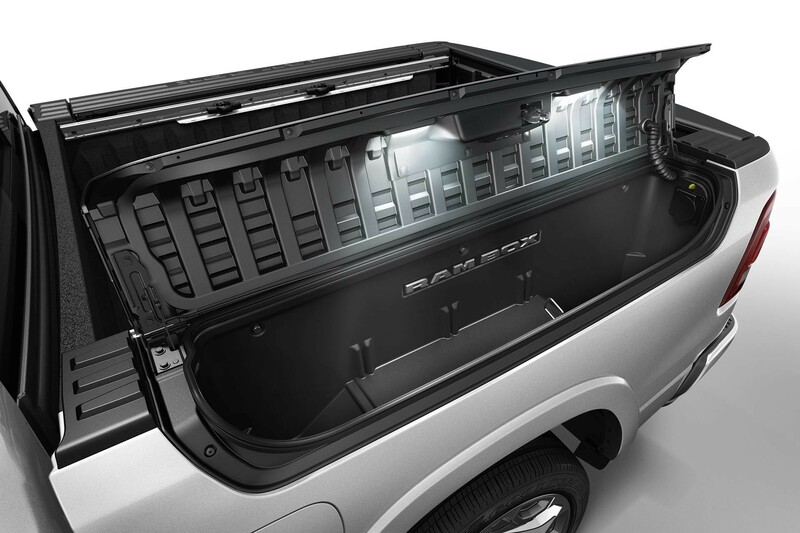 The side view shows the convenient RamBox® Cargo Management System that delivers extra storage for you. 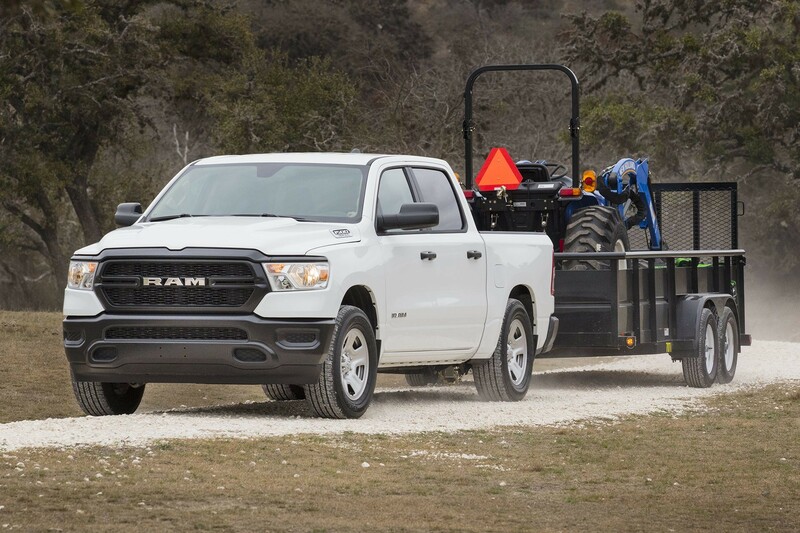 Don’t worry about the power you may need to get the job done, this All‑new Ram 1500 can handle the task. Now with 98 percent high‑strength steel, it’s engineered to deliver the long‑term durability that you want. 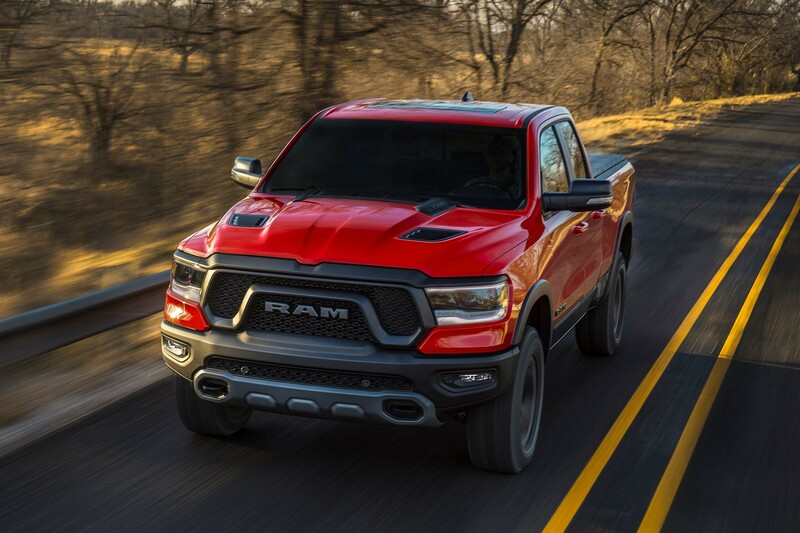 Drives equally with grace and power in any setting and conducts itself with a “can‑do” attitude. 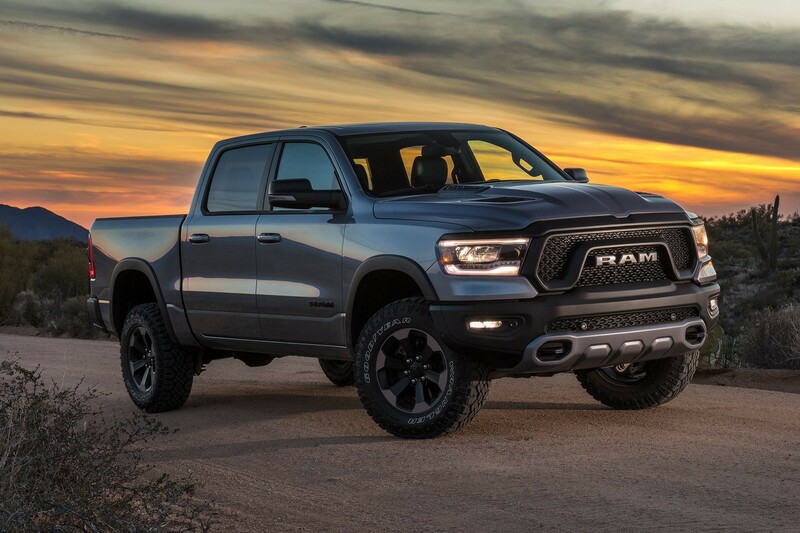 It’s not always about business, but when you have the time, you’ll know the All‑new Ram 1500 is up for adventure. 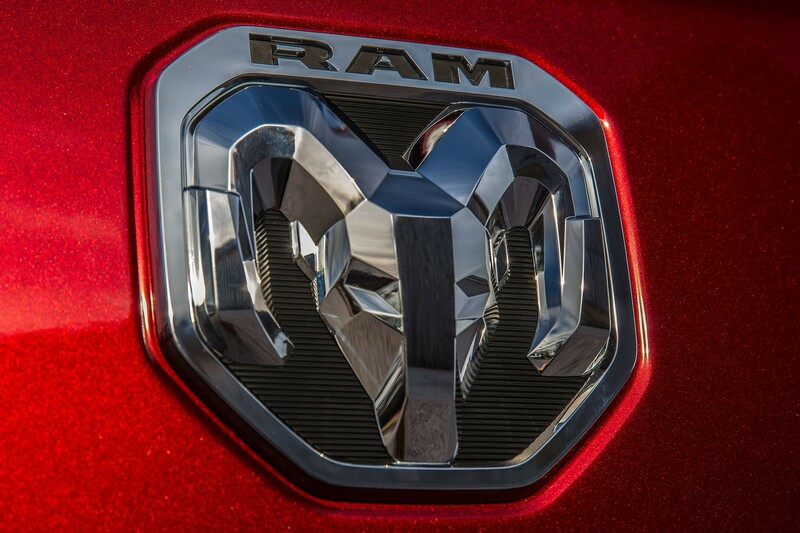 Unmistakably composed, capable and fuel efficient. 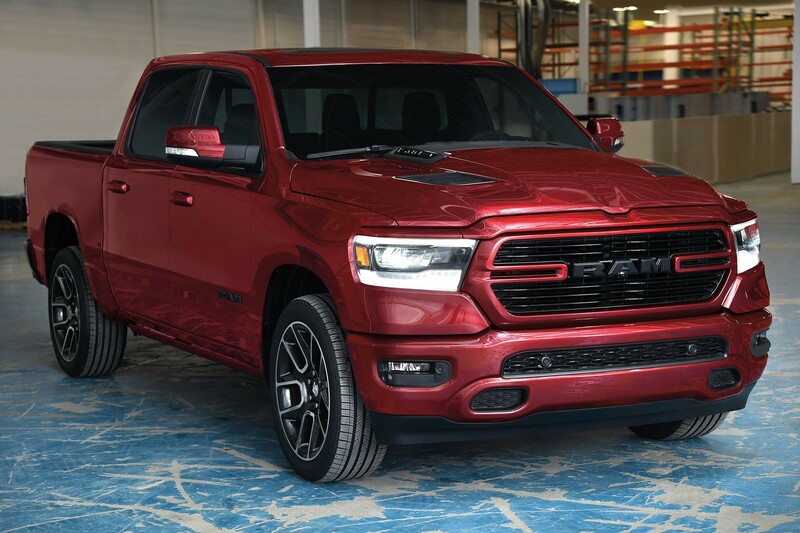 Choose from an array of paints, wheel designs and trims to customize your All‑new Ram 1500 to suit your tastes. 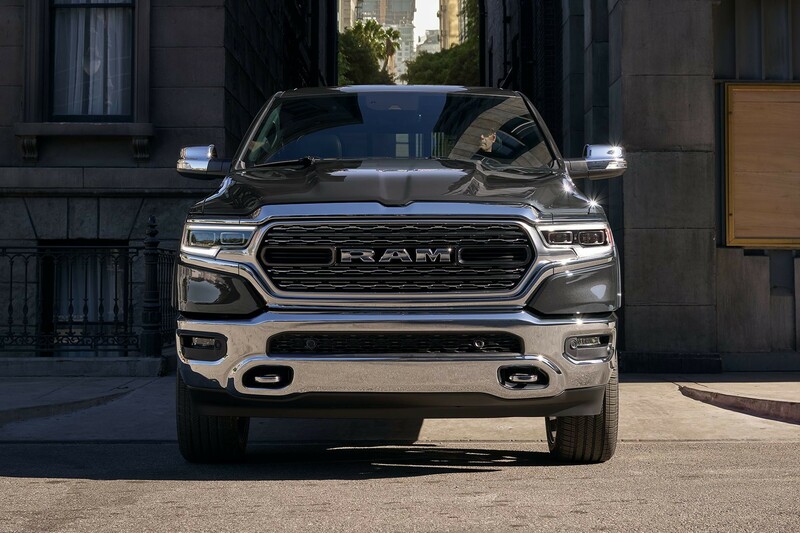 The available headlight options light the way for you.